Somehow this never got posted in 2011. The course has now morphed into a course offered in Sophomore College ChemEng12SC. “Art, Chemistry, and Madness: the Science of Art Materials” (ChemEng80Q) is a sophomore seminar course offered at Stanford. For those of you interested in art conservation or conservation science, this is the class for you! Although it’s in the chemical engineering department, it attracts a diverse group of students, from artists and art history majors to chemists and everyone in between. 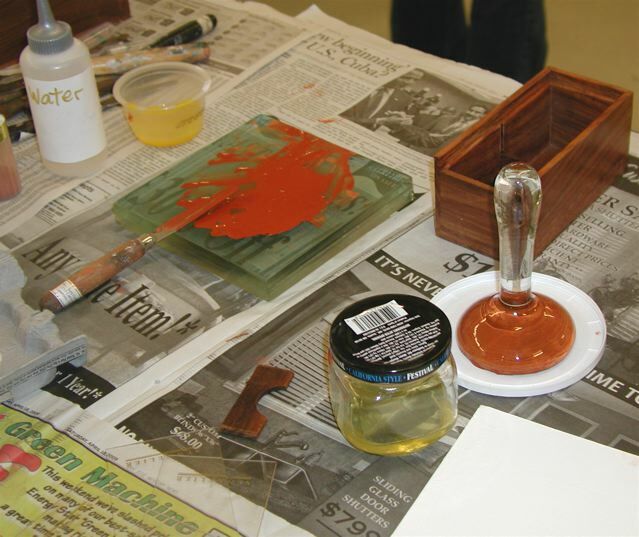 While everyone takes it for different reasons– some to expand their knowledge of art materials, others to learn chemistry in an unusual context– the overwhelming consensus is that the class is a ton of fun. There are two lectures each week and a lab section. 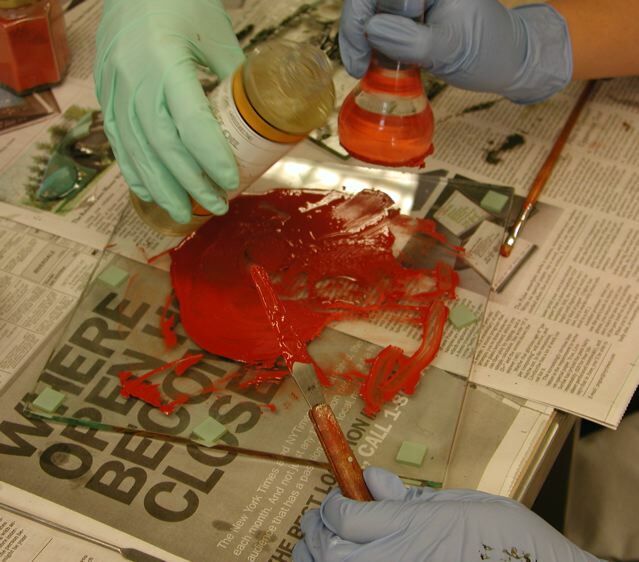 The lab section, taught by an art instructor, lets you experiment with the materials you learned about in lecture. Coming from a chemistry background, this was incredibly important for me to really understand the concepts we were learning in class. For instance, I had never worked with oil paints before. In class we learned that the “drying” mechanism for oils does not actually involve drying, ie the evaporation of water. Instead, oil paints are made from highly unsaturated fatty acids that slowly react with molecular oxygen and light to crosslink, polymerize, and solidify (not unlike an epoxy resin). This was alarming to me– it must take forever for an oil paint to dry! It turns out this is true, and depending on the thickness of the paint, it can take years to dry. We got to experiment with this first hand in the lab, where we ground our own pigments and made our own oil paints with a variety of different drying oils, like linseed oil and poppyseed oil. We even got to paint on the canvases that we had learned to stretch in a previous lab. The organization of the class facilitates learning in a way most classes cannot. Students making oil paint. One student is adding a drying oil while the other is mulling the paint. Note the gloves and lab coats- this is a science class! 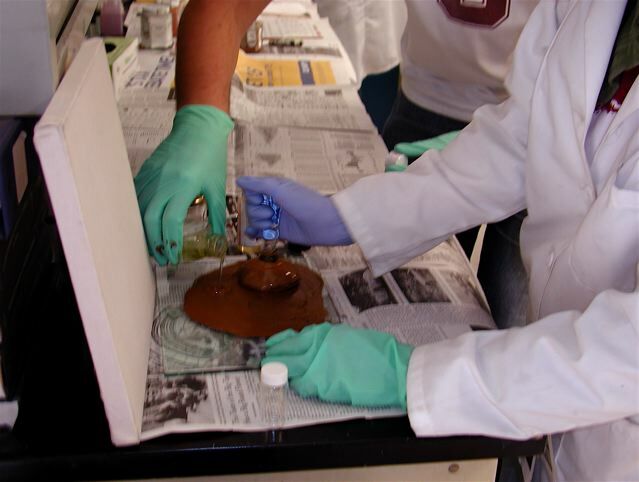 Making oil paint in lab. Making egg tempera in lab. 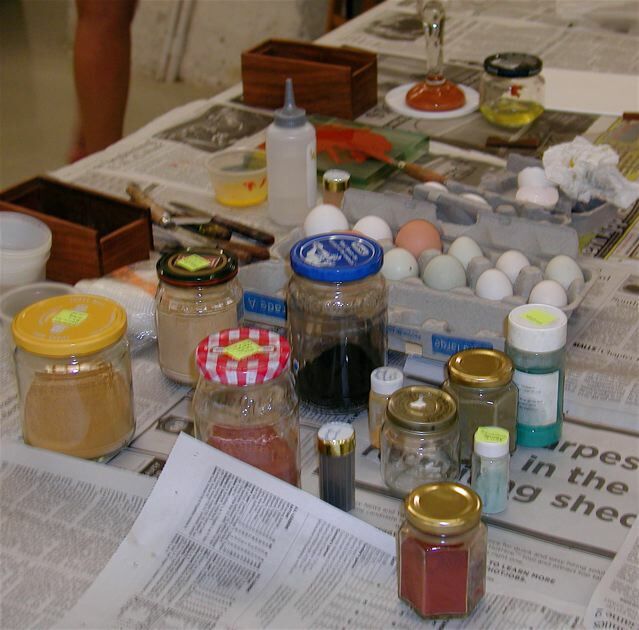 Eggs, pigments, and skilled hands are all you need to make egg tempera. ← Coming soon: Spring + Summer Fellows Announcement!